I believe this must be how donuts were intended to turn out, because they’re absolutely perfect for dunking in coffee. 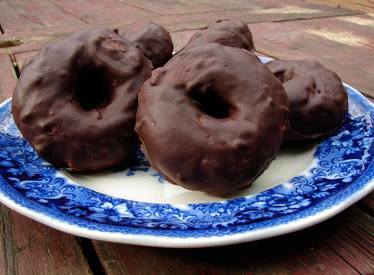 The chocolate melts, the doughnut softens, and then, you just want more! I bought some almond essence, after resisting for years. I resisted because I was semi-obsessed with it as a child, and put it in everything. Well…I am once again putting it in everything! It was nice here, though. It made the doughnut interesting without adding too much texture or craziness. You could replace it with cinnamon or lemon zest or any kind of flavoring you like. Or just leave it out altogether.